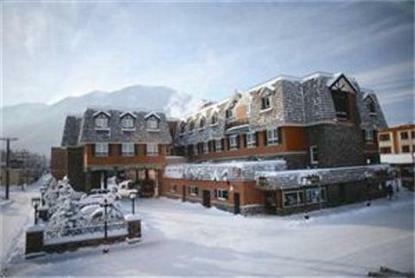 In the heart of downtown Banff the Mount Royal Hotel offers 135 comfortably appointed and recently renovated guest rooms. All rooms have air conditioning.. cable television.. coffee maker.. alarm clock.. in-room electronic safe.. iron/ironing board.. as well as our standard amenities. At Tony Romas Restaurant, enjoy breakfast.. lunch or dinner while admiring some of the beautiful mountains of the Canadian Rockies. Or enjoy a drink in the newly renovated Tony Romas Lounge offering a cozy fireplace and flat screen televisions. At our Buffalo Paddock Bar and Grille take advantage of our relaxed and playful atmosphere. You will find a varied combination of activities such as Video Lottery Machines/Slot Machines.. Pool.. Shuffleboard.. darts.. or if you want to try your hand/voice you can reserve our private Karaoke Room for a truly unforgettable night. During our winter season we offer complimentary ski lockers and we are the central location for transportation transfers from the hotel direct to/from all local ski hills. Our on-site Sightseeing Desk has all the information you will need about the ski hills and area attractions to make your stay a memorable one - they even sell tickets to local sightseeing opportunities. After a full day of excitement and new experiences we invite you to relax in our Jacuzzi or Sauna before you head off to bed dreaming of the past days adventures.